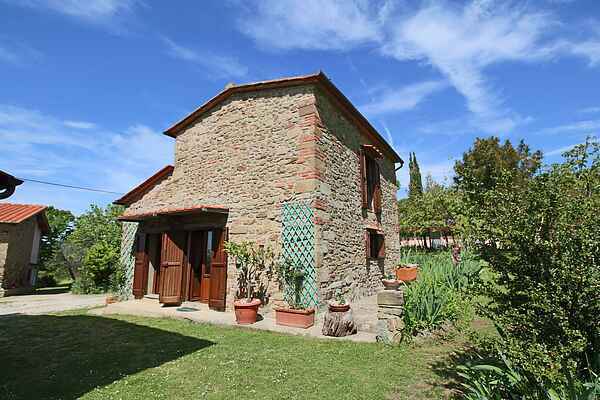 This rural agritourismo is surrounded by forests, olive groves and vineyards and is located near Castelfranco di Sopra. Solar panels have recently been installed on the property of the agritourismo and organic olive oil and wine are produced. There is a communal garden with tables and chairs and a large swimming pool with a panoramic view of the valley, ideal to spend hours of relaxation and enjoyment. In the small restaurant on the agritourismo you can sample the simple local fare with natural indredients. In the summer you can dine in the garden, and with a little luck, you will see pigs, hares and foxes. Castelfranco di Sopra is a beautiful village at the foot of the Pratomagno. The unique nature in this area has fascinated generations of travellers, including Leonardo da Vinci, who produced many paintings and drawings of the area. Internet wifi only available in common areas. MUSEUMS IN VALDARNO San Giovanni Valdarno Museo Casa Masaccio Museo della Basilica Santissima delle Grazie Terranuova Bracciolini Centrovisita della Riserva Naturale Valle dell’ Inferno e Bandella Montevarchi Museo d’ Arte Sacra della Collegiata San Lorenzo Museo Ernesto Galeffi Museo Paleontologico Loro Ciuffenna Casa Venturino Venturi Museo Venturino Venturi Cavriglia Museo della Miniera Museo della Pieve ALSO VISITS TO FLORENCE AND AREZZO ARE VERY INTERESTING.